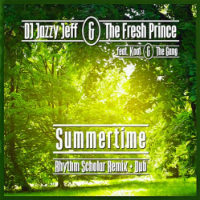 Rhythm Scholar optimistically chooses Jazzy Jeff & The Fresh Prince’s Summertime for his latest remix trick. Has he seen the forecast for tomorrow? Obviously not. Mind you – that’s over here while he’s over there where the North Korean Missile Crisis has been hotting up. Apparently, there nothing like the flash from an atomic blast to give you a tan. All that aside, here is a certain 1991 hit with a new Rhodes piano solo and a plethora of samples from Kool & The Gang to The Eagles – or as Will Smith once put it, “Here it is the groove slightly transformed…” Cop it HERE – listen below.